Photo by Indonesian Embassy in Hanoi. In total there are 300 voters registered for 2019 overseas general election in which 265 of them are registered to come directly to polling station while 35 people voted by post. Until the closing of polling station at 6 pm on Sunday, 200 voters have used their right to vote and 28 voters have sent back the ballot by postal service to the committee. 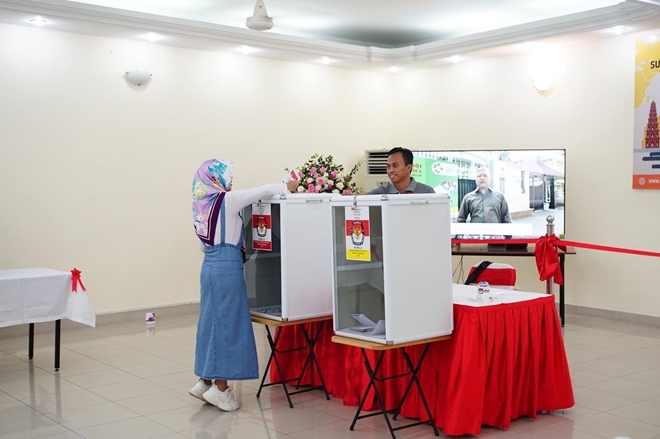 2019 Indonesian general election is the first election in Indonesia in which voters can vote for President, Vice President and the House of Representative Members at the same day. There are two pairs of President and Vice President candidates, namely the incumbent President Joko Widodo with Ma’aruf Amin as Vice President and former General Prabowo Subianto and Sandiaga Uno as the other President and Vice President candidate.